This topic explains the steps necessary to configure your environment for Windows Analytics: Update Compliance. Ensure you meet the Update Compliance prerequisites. Add Update Compliance to your Azure subscription. Use Update Compliance to monitor Windows Updates, Windows Defender Antivirus status, and Delivery Optimization. Update Compliance works only with Windows 10 Professional, Education, and Enterprise editions. Update Compliance only provides data for the standard Desktop Windows 10 version and is not currently compatible with Windows Server, Surface Hub, IoT, etc. Update Compliance provides detailed deployment data for devices on the Semi-Annual Channel and the Long-term Servicing Channel. Update Compliance will show Windows Insider Preview devices, but currently will not provide detailed deployment information for them. Update Compliance requires at least the Basic level of diagnostic data and a Commercial ID to be enabled on the device. To show device names for versions of Windows 10 starting with 1803 in Windows Analytics you must opt in. For details about this, see the "AllowDeviceNameinTelemetry (in Windows 10)" entry in the table in the Distributing policies at scale section of Enrolling devices in Windows Analytics. To use the Windows Defender Status, devices must be E3-licensed and have Cloud Protection enabled. E5-licensed devices will not appear here. For E5 devices, you should use Windows Defender ATP instead. For more information on Windows 10 Enterprise licensing, see Windows 10 Enterprise: FAQ for IT Professionals. Update Compliance is included at no additional cost with Windows 10 Professional, Education, and Enterprise editions. 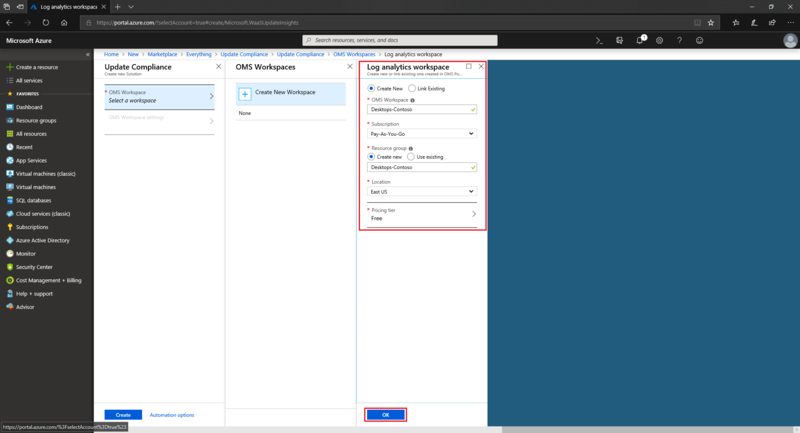 An Azure subscription is required for managing and using Update Compliance, but no Azure charges are expected to accrue to the subscription as a result of using Update Compliance. 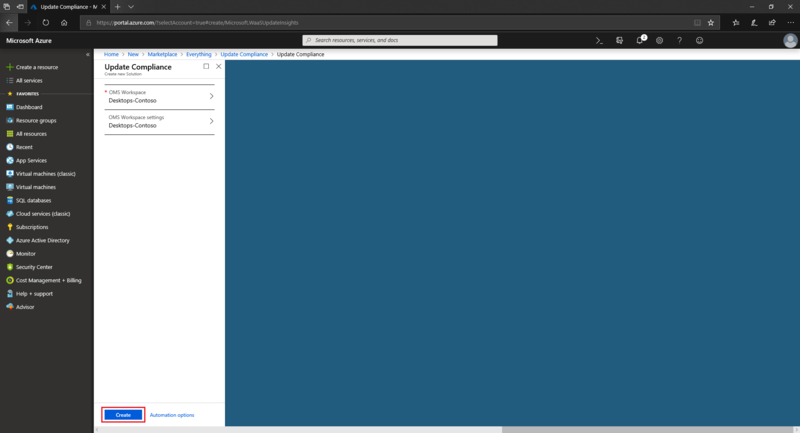 In the Azure portal select + Create a resource, and search for “Update Compliance". You should see it in the results below. Select Update Compliance and a blade will appear summarizing the solution’s offerings. 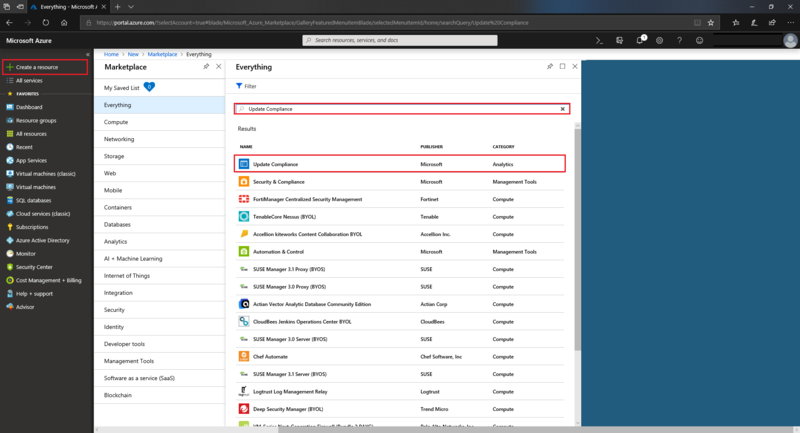 At the bottom, select Create to begin adding the solution to Azure. Choose an existing workspace or create a new workspace that will be assigned to the Update Compliance solution. If you already have another Windows Analytics solution, you should use the same workspace. The resource group and workspace creation process could take a few minutes. After this, you are able to use that workspace for Update Compliance. Select Create. 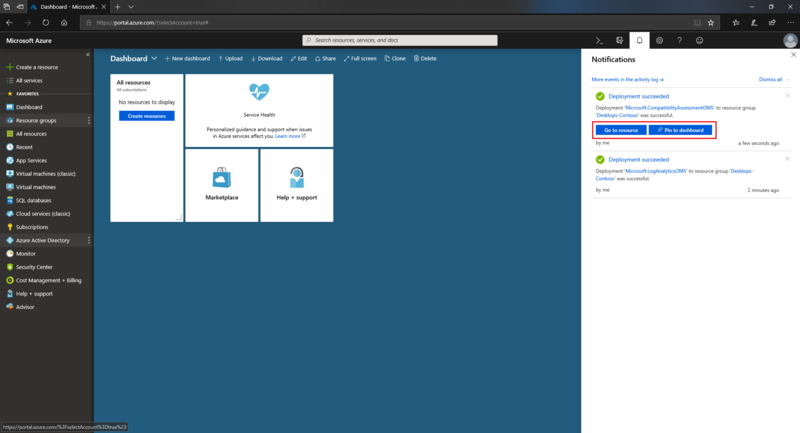 Watch for a notification in the Azure portal that your deployment has been successful. This might take a few minutes. Then, select Go to resource. 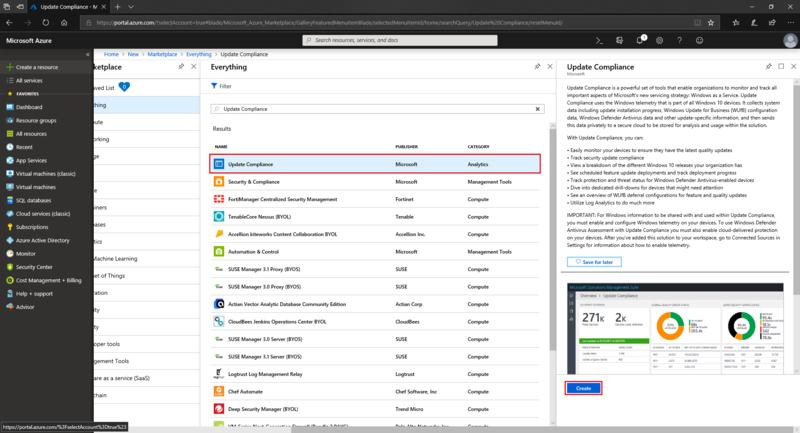 Deploy your Commercial ID (from the Update Compliance Settings page) to your Windows 10 devices (typically by using Group Policy, Mobile Device Management, System Center Configuration Manager or similar). Ensure the Windows Diagnostic Data setting on devices is set to at least Basic (typically using Group Policy or similar). For full enrollment instructions and troubleshooting, see Enrolling devices in Windows Analytics. After enrolling your devices (by deploying your CommercialID and Windows Diagnostic Data settings), it might take 48-72 hours for the first data to appear in the solution. Until then, Update Compliance will indicate it is still assessing devices.